Making your Protein Shakes perfect – every time. I love Protein Shakes. I have made many in my time – all kinds of different ones. All of which taste like dessert – but the beautiful thing is that they are healthy, protein-packed and delicious! I have never made a veggie-full protein shake yet so this is not what this post is about. This post is about what goes in a protein shake recipe – not one particular recipe, but any recipe that I make for protein shakes! 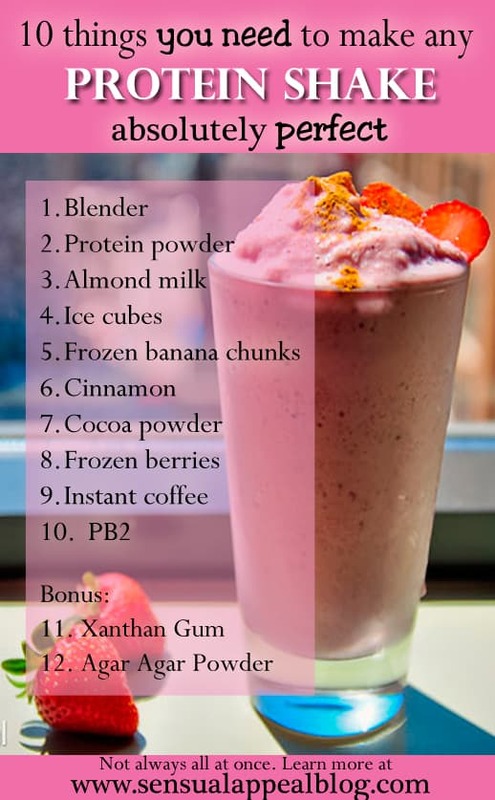 Basically, these are the things I always keep on hand so I am able to create any kind of dessert-y protein shake my heart desires, at any time! The checklist lists all of the ingredients I usually have on hand that allow me to create any protein shake I would ever want (that I like). 1. Blender – obviously, you can’t make a protein shake that tastes like a milkshake if you don’t have a high power blender, right? You’ve gotta be able to mix it all up well so not chunks remain. 2. Protein Powder – there are so many protein powders out there, it really depends on your own preferences with which one you’d like to use the most. There are tons of flavors and brands you can choose from. Read about how each protein powders differ from each other and what brands I recommend or have used in the past by clicking here. 3. Almond Milk – Unsweetened vanilla flavor is my favorite thing to add to my smoothies and protein shakes. Why? It adds a wonderful slightly creamy consistency without the extra calories! It’s perfect. My favorite? Silk PureAlmond. 5. Frozen banana – This is a secret many people don’t know about, but if you cut your ripe bananas into chunks and store them in a freezer they are a perfect addition to protein shakes. They make the protein shake SO creamy that you can even call it soft serve! Try it! 6. Cinnamon – I already raved about why cinnamon is one of my favorite spices. It has a ton of great health benefits plus it adds a great hint of flavor to your protein shake. 7. Cocoa powder – Feeling like a chocolate milkshake? Make it a Chocolate Protein shake instead. I always have cocoa powder on hand to add to protein shakes if I get a craving for chocolate – delicious! Especially if you use Special Dark Hershey’s cocoa powder – the Dutch cocoa mixed with natural cocoa gives it an amazing flavor. 9. Inka (grain coffee-like decaf beverage) or Instant coffee -I add this for my Mocha Protein Shake, it tastes great with cocoa powder as it enhances the flavor. Plus what else is better than drinking a protein shake in the morning that has a delicate flavor of a latte? Yum. 10. PB2 -Otherwise known as defatted peanut butter, this baby is a must if you want to make peanut butter flavored protein shakes. Since it’s a powder, it does not add extra fat to the protein shake and the consistency is perfect! Great addition with a great flavor punch of peanut butter. Xanthan Gum & Agar Agar Powder – the combination of xanthan gum and agar agar powder make the protein shake into something even better. The two combined add a creaminess and thickness to the smoothies. And when used with a frozen banana you could easily make this into a delicious dessert that I like to call Protein Soft Serve! Just be sure to add a TINY bit of each at a time. If you add too much, the shake won’t be eatable. I recommend starting out with a slight pinch of each, maybe 1/16th or 1/8th of each, depending on how big your protein shake is that you’re making. A little goes a LONG way! PS. If you aren’t yet signed up for Vitalicious (my favorite health product online store website), do it by clicking here so you can get $10 off your first purchase! 🙂 and I get it too for referring you. Win-win! What are some ingredients YOU always have on hand for protein shakes? I make my morning shake with spinach, frozen blueberries, strawberries, pineapple, banana, tbsp of olive oil and vanilla flavored protein. I usually make it with bottled water, but every now and then I make it with fat free milk. Interesting combination! Sounds awesome, Greg. Can you taste the spinach? A good blender definitely makes a difference in how it tastes. After switching to the ninja mega system early this year, there was definitely a difference in how well it mixed/flavor. Yes, thanks for the blender recommendation – I actually use a pretty old blender. Those babies are just so expensive. But I’m saving up to be able to get a better one. Do you know what specific Ninja model you use? Here is a link to the exact model I use. The great thing is that it has 2 personal use cups. I need to actually buy a blender so I can start making smoothies. Yours looks delicious. Yep. I use them ALL and they are all wonderful for making the best shakes. Ahhh, totally drooling AGAIN over your strawberry cheesecake shake…that is one helluva shot girl! Love the melty drippy action! 2. I alway always always add at least half a frozen banana, ice cubes, and xanthan/guar gums for thickening, but I also like to experiment adding in pumpkin puree, avocado (you can freeze those too! ), and different spices. Wait, I had no idea you could freeze pumpkin and avocado. Do you scoop it out into a ice cube tray and freeze that way? And what about avocado? Also, does the avocado then stay fresh longer? I have one here (that I will probably use tomorrow) but I’m going grocery shopping tomorrow and I always wanna get more avocado but there have been times where I never ended up eating it. And I hate knowing I spent money for nothing. Oh yeah! I’ve never frozen the pumpkin puree but you could totally do it in some ice trays…as far as the avocado, I usually just slice it into fourths and put them in a freezer bag, but you can also mash it up too! I eat the same smoothie everyday (except right now as I’m following The Fast Metabolism Diet) and I do make them veggie packed. Particularly spinach although sometimes I use Kale. I love the variety you have going on here and am going to have to rethink things. I feel like it’s time to shake things up. Let me know if you do end up making any changes to your protein shake repertoire. I’d love to hear about it and your thoughts compared to your current favorite smoothie.